1.6 3G(UMTS) or 4G(LTE) modes? 2.7 Where to buy Air Tube earphones? 2.8 Where to buy cellphone RF protection case? There is no such thing as a low radiation mobile phone, so in general, I recommend to use mobile phones only on emergencies. when you do have to use it try to follow the following recommendation to minimize your exposure to the EMF/EMR(Electromagnetic Fields/Electromagnetic Radiation) mobile phones emit. Minimize the use of mobile phones as much as possible. 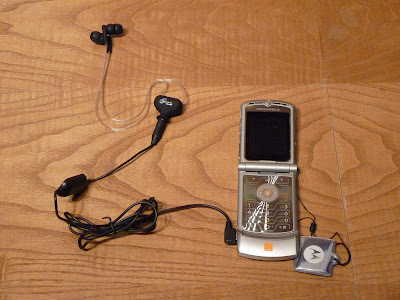 When there is a wired phone or PC, prefer to use it over mobile phones, wireless phones, and wireless PCs. Remember to turn off the phones' 3G/4G data and WIFI when not using it. Configure your mobile phone not to sync applications without your approval, so the phone will not radiate all the time when the 3G/4G data or WIFI is ON. Keep the mobile phone off your body at all times. While talking on your mobile phone try to keep a safe distance from it while using the speakerphone, a wired air tube earpiece or a regular wired earpiece. Don't use the mobile phone in close spaces or metal enclosures like elevators, cars, public transportation, basements. In this place, mobile phone transmission will be more powerful. In the car use only fixed UMTS mobile phone with an external antenna or a UMTS mobile phone with a hand-free kit equipped with an external antenna. 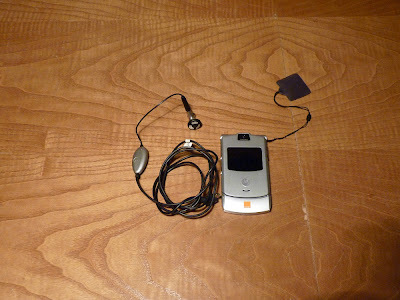 As far as the ELF magnetic and electric fields are concerned, better use a UMTS (3G) phone over a GSM phone (2G). Don't use Bluetooth devices, as when coupled both phone and device emit RF radiation all the time. Ask people to call you at home after work hours. Configure call transfer to your home landline wired phone in case there is no reception. When you get to your home simply turn off your mobile phone and get all the calls transferred to the landline phone. How to connect my android to a USB or network? How to connect my iPhone to a iMac or network? For EHS people using a cellphone or smartphone should be done only on emergencies as every use will most likely cause pain! I think that using a mobile phone should be limited to only short "must" or "emergency" calls. Using a mobile phone exposes you, people around you and people who are in the vicinity of the mobile phone masts to electromagnetic radiation (both RF and ELF), so I think that limiting the time you use the mobile phone is a smart thing to do. However, sometimes you have to use the mobile phone, to call the police, to ask for help, to say you are late, to ask for directions. I suggest that you should try to reduce your exposure to electromagnetic radiation as much as possible while using the mobile phone. Even if you use the mobile phone once in a while, I still suggest you try and limit your exposure to the electromagnetic radiation from your mobile phone. Most people don't know that a smartphone emits Radio Frequency radiation most of the time even when not making a call. It receives and transmits also on standby mode, when surfing the web or while operating the application. This emission is done because the smartphone is not really idle. It communicates to the network via WIFI or 3G/4G/5G to send and receive information, text messages, data, and other needs. This emission increases the users' exposure to RF radiation both on the time scale and on the frequency span. The user is exposed more time, to more signals in different frequencies. This can also lead to higher battery consumption and shorter use time. The way to handle it is to turn OFF WIFI, Data, Bluetooth and other communications of the smartphone. This way the phone will still receive phone calls and SMS but not data, not whatsup and not other application related info. This way the number of times the phone emit radiation in a minute and the duration of the communication will be reduced dramatically. You can turn these communications back ON when needed, but remember to turn them OFF again when done. This goes for non-EHS people. I think EHS people should not use a cell phone at all, and it they do, they should use them only on emergencies. On this page, we will instruct you how to turn the WIFI and Data connection ON and OFF. When talking on the mobile phone, the mobile phone emits changing levels of electromagnetic radiation (High-frequency RF single). In addition, the cell phone emits also low frequencies EMR created in his electronic parts, boards and as created in the processes of the RF signal transmission. The levels are dropping as you move away from the device. The most sensitive part of the body, to electromagnetic radiation, is considered by many to be the head. I think that other parts of the body might also be very sensitive to electromagnetic radiation. The first thing I feel when I am exposed to electromagnetic radiation is a headache but this does not say that only the head is affected. Having said that I would suggest not to put the mobile phone next to your head while talking but I would also suggest not to put it in your pockets or in your belt clip, try to stay as far as possible from it at all times especially when making a call and during conversations. As said, every cellphone emits EMF/EMR(Electromagnetic Fields/Electromagnetic Radiation) when using it to talk. Smartphones transmit also on idle mode, while the applications that are installed on them transmit and receive data over the cellular network. The signal then passes all the data is called radio frequency (RF). Apart from the RF EMF/EMR also low frequency electric and magnetic fields are created. These fields are reduced very fast as you move away from the source. In most cases half a meter from the source you will not be able to measure their levels as they drop considerably. The RF EMR, on the other hand, is measurable even few meters from the cellphone. Because the differences in the RF signal of second generation (GSM) and third generation (UMTS) phones, In 3G (UMTS) phones a much lower electric and magnetic fields are created, compared to 2G (GSM). Therefore my recommendation is to use (with a speaker or an AIRTUBE earpiece) a simple (not a smartphone) 3G (UMTS) mobile phone (and not 2G). Smartphones have many applications installed on that access the web via the WIFI or 4G/3G connection. They use this connection to send and receive data and communication. These communication bursts happen every several seconds or minutes (depends on the way you use the smartphone and on how you config it), and every time a communication is done the smartphone is emitting RF radiation. This transmission exposes the use to RF radiation and exhausts the battery, shortening the stand by operation time of the smartphone. Therefore we recommend turning the 3G/4G data and WIFI OFF at all time. Turn them on when you must surf the web or us the application and then turn the back OFF when you are finished. In the last year (2015) I compared several times between 3G and 4G, and it seems that smartphones emit more RF radiation in 4G modes. This might be unique to where I live in (Israel) but it is more possible that it is because of the modulation of 4G-LTE. SAR is heat based measuring standard and I find it to be insignificant. Since there is no other way to differentiate between the possible radiation emission of one cell phone to the other, SAR can be used to do that. Please note that it does not mean that low SAR phones are safe! So what can you do if you do want or need to use the mobile phone but still want to limit your exposure to electromagnetic radiation? I think the best thing to do is to use AIR TUBE earphone or the speaker mode and hold your mobile phone as far away as possible from your head and body. If you use the speaker phone or AIR tube and the mobile phone is still next to your body, head, on your belt clip or in your pocket you still get exposed to electromagnetic radiation. You need to remember to keepa distance from the mobile phone as much as possible while it is emitting electromagnetic radiation. Most of today mobile phones have a speaker option, and together with holding the mobile phone far from your head and body, using it will limit your exposure to electromagnetic radiation emitted by your mobile phone (both high frequencies and low frequencies). But sometime you can't use the speaker phone option, like when there is a lot of ambient noise, when you don't want other people to be disturbed by the conversation and some other reasons. Using regular earphone allows you to hear and to be heard better than when using a speaker phone while reducing your exposure to electromagnetic radiation since the mobile phone is no longer next to your head (the far it is the less electromagnetic radiation is getting to you). But some of the high frequency electromagnetic radiation makes it's way on the earphone wire to your head. RF and ELF radiation from a wired ear piece with comparison to air tube ear piece. Using an Air Tube earphone allows you to hear and to be heard better than when using a speaker phone while reducing your exposure to electromagnetic radiation. In a regular wired earphone, some of the high frequency electromagnetic radiation makes it way on to the earphone wire and to your head. 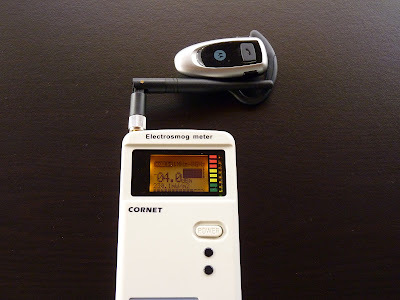 When using an Air Tube wired earphone most of this radiation does not reach the ear or head. In an Air Tube wired earphones, the wire goes up as far as 20 cm from the head. It has 2 speakers and a microphone and the sound from the speakers is making its way to the ear via one or two air tubes which can pass air waves and sound but do not carry electromagnetic radiation. In an Air Tube earphone, some of the electromagnetic radiation makes its way onto the wire but not to the head since there are no metal wires coming up to the head. You still have to keep the mobile phone as far as possible from your body, and the long wire of the Air tube earphone allows you to do so. When I must use the mobile phone I usually start to feel bad after several seconds (about 20 seconds) of using it against my ear. If I use a regular wired earphone the headache appears after a minute. Using the mobile phone speaker allows me to use the mobile phone for up to 2 minutes, depending on how far I can place the mobile phone (and still hear and be heard). When I use my wired air tube earphone I can talk for about 3-4 minutes until the first sign of a headache appears. 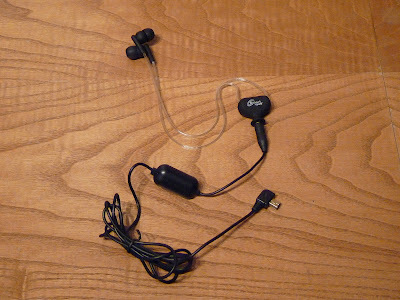 In addition, using the wired air tube earphones allows me to place the mobile phone far away from me and still hear and be heard. First I did not believe that this wired air tube earphone is really working, that it is worth the money and that it is better than the ordinary wired earphone. But when I did some tests and measurements I noticed that most of the electromagnetic radiation that was making its way up the wire was "stopped" at the speakers and did not make its way to the user ear. Later on, I tested it on myself several different occasions when I had to use the mobile phone, and was amazed as I did not feel the expected headache, even after a 3 minute call. Usually, when I use a regular wired earphone I can use the mobile phone for only 1 minute before I feel the pain. If I would (and when I used to) use the mobile phone and I put it next to my head the expected headache appeared after only 20 seconds. 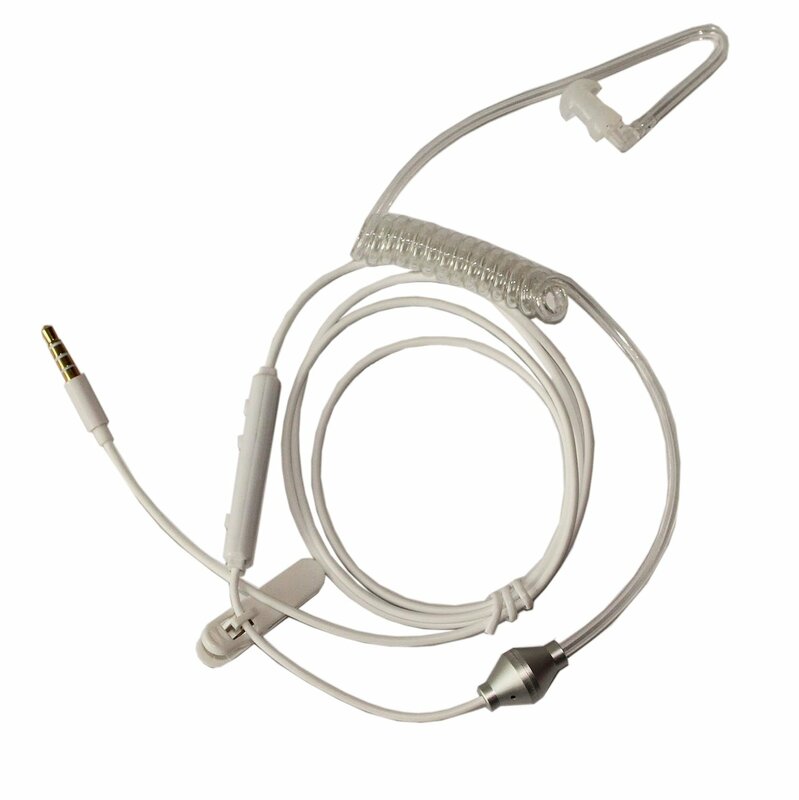 In the market today you can find many types of bluetooth and wireless earphone, some types even have air tubes. Using a bluetooth device exposes you to some additional electromagnetic radiation from the bluetooth device and from the mobile phone, in addition to the one emitted from your mobile phone when making a call. In addition, people usually tend to keep their bluetooth device working all the time. Bluetooth devices and mobile phone with their bluetooth connection enabled emits electromagnetic radiation all the time. I don't recommend using a bluetooth devices or earphones even when it comes with an Air Tube. I recommend using a wired earphone with an air tube. This does not mean that if you have them you can use the mobile phone as much as you like. It simply means that when using the mobile phone with these wired earphones (and keeping the mobile phone as far as possible from your body) you get the less possible electromagnetic radiation exposure as possible today. Where to buy Air Tube earphones? Different types of wired air tube earphones can be purchased on our amazon store. Where to buy cellphone RF protection case? Different types of cellphone RF protection case can be purchased at amazon. Please checkout the earphones on our amazon store.